I have meant to review this restaurant since Alfredo, the owner, invited me to its opening – and the opportunity presented itself when I had to attend a meeting at the offices of well known Mishcon de Reya Solicitors whose offices are 200 yards from Isola Bella. Very popular with the locals who had no problem in pointing me in the right direction when I asked for Isola Bella's whereabouts from Red Lion Square. Whilst the usual assortment of Italian favourites are present in the Pizza, Risotto and Pasta sections I particularly recommend the Gamberoni picante £ 7.95 to start followed by a paillard of veal (not in the menu) or the delicious grilled Dover sole which at £19.95 is a bargain. Torta de miele a warm apple tart with vanilla ice cream £ 5.25 accompanied by a glass of limoncello £ 3. Large mirrors decorate the walls giving the restaurant a cosy atmosphere. Most importantly is the warm welcome and friendliness of the staff. Alfredo is a true professional and he has trained his personnel to offer that exclusive hospitality present only in the few establishments where one can genuinely say: Le patron mange ici. Reservations are advisable. 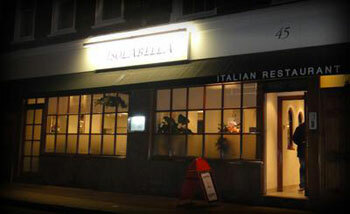 Wines from £14.95 to £ 45 are well chosen and all Italian. French champagnes: from £ 45 to £225. If you are flying from Heathrow Terminal 4 stop at Caviar House & Prunier for a glass of their excellent Lizard Hill Sauvignon Blanc (£5.50) and their superb Scottish Smoked salmon £15.00. Scarlatto - 250 W 4th St. Betw Broadway & 8th Ave 212 730 4535 Huge portions -- can share $ 110.82 for 3 with bottle of wine! Excellent quality. Highly recommended. The shank of lamb is impressive and delicious.